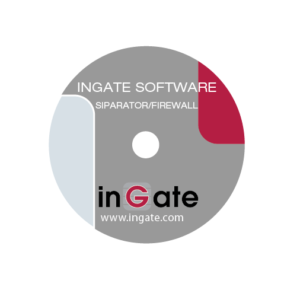 Adopting global SIP communication is a simple process with the Ingate Software SIParator®/ Firewall® – the solution for enterprises that want to deploy Ingate SBC products on their own hardware platforms. Like all Ingate SBCs the Software SIParator®/ Firewall® makes secure SIP-based communications – including VoIP, SIP trunking and UC – possible and the Software SIParator®/Firewall® is the software version of Ingate’s E-SBCs, the Ingate SIParator®/Firewall®. It is an ideal solution for IP-PBX vendors, system integrators and other customers that want to deploy a large number of Ingate products on their own hardware platform. The Software SIParator®/Firewall® is designed to be installed on a virtual machine using one of several hypervisors. The Software SIParator®/Firewall® is the same software that runs on Ingate’s award-winning E-SBC hardware products. The Software SIParator®/Firewall® can handle up to 2,000 Concurrent Call Sessions or simultaneous calls. 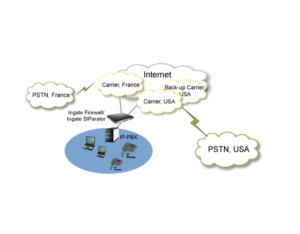 Ingate’s architecture boasts a true SIP proxy controlling the built-in firewall which enables secure firewall NAT traversal of the SIP traffic. Ingate E-SBCs support Transport Layer Security (TLS) for secure SIP signaling. They also support and transcodes to encrypted SRTP (Secure Real-time Transport Protocol), providing a high level of security for live data with advanced encryption, confidentiality, message authentication and replay protection. When combined, these protocols further shield users from eavesdroppers, hackers and spoofers. with an existing network firewall to allow SIP traffic to traverse the enterprise edge. It can also be set to alone secure all SIP and data traffic. To learn more about the Software SIParator®/ Firewall® and supported hardware. More and more Internet Telephony Service Providers (ITSPs) offer SIP trunks. 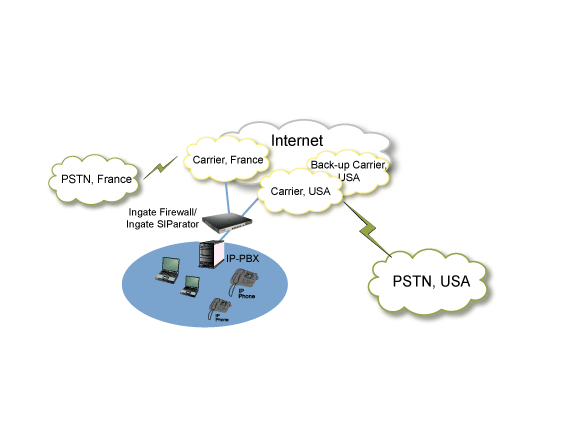 The SIP trunk can be delivered over the public Internet or a dedicated connection and both these models are supported by Ingate’s E-SBCs. All Ingate E-SBCs include the Ingate SIP Trunking software, which makes SIP trunking possible by solving Network Address Translation (NAT) traversal, allowing the enterprise to connect to the SIP trunk. They also solve compatibility issues between the IP-PBX and ITSP, ensuring a quick and simple deployment. • Ingate SIP Trunking allows enterprises full use of their IP-PBXs and not only communication over IP within the enterprise but also outside the enterprise. Licenses for the number of concurrent calls needed over a particular trunk group are easily added. • Ingate Remote SIP Connectivity allows remote and mobile workers to work from behind a NATing device at home, a hotel or wireless hotspot and make and receive calls using the IP-PBX located at the corporate headquarters. One simply adds the number of Remote User SIP Session licenses needed. • Ingate Enhanced Security allows support for TLS and encrypted SRTP. • VoIP Survival allows an enterprise using a centrex or hostedPBX solution to fail over to the Ingate product, to enable internal calls and redirect outside calls to a local PSTN gateway. • SIP Registrar user licenses make the Ingate SIParator®/Firewall®the primary registrar server and permits SIP clients to register.